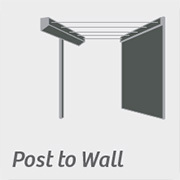 The Austral RetractAway clothesline may be mounted in four different configurations; Wall to Wall, Wall to Post, Post to Wall and Post to Post. 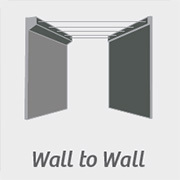 Below are the various accessories required for each installation option. Retractable mounting bar – centre to centre bolt holes measure 783mm. Retractable catch – centre to centre bolt holes measure 35mm apart. 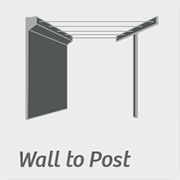 Installing the optional ground socket (in configurations 2,3 & 4) allows the post to be removable. Austral does not recommend the use of 2 Ground Sockets for Post to Post installations. 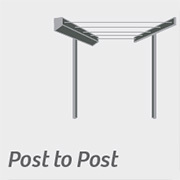 Austral recommends the Post which is to hold the RetractAway Cabinet be cemented into the ground to ensure maximum stability.